Travels with a Tin Donkey: La Savoureuse—a tasty ride in Belgium! 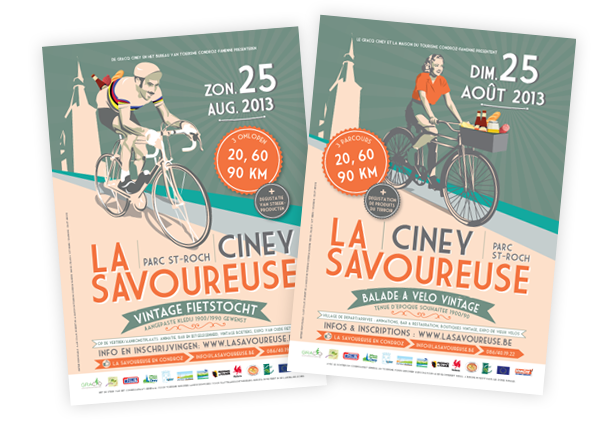 La Savoureuse—a tasty ride in Belgium! With the runaway success of l'Eroica in Italy (with its 17th edition just completed and now about to be franchised to the United Kingdom and Japan), retro-rides continue to blossom. With the enthusiastic participation of local tourism agencies we see new events throughout Europe. 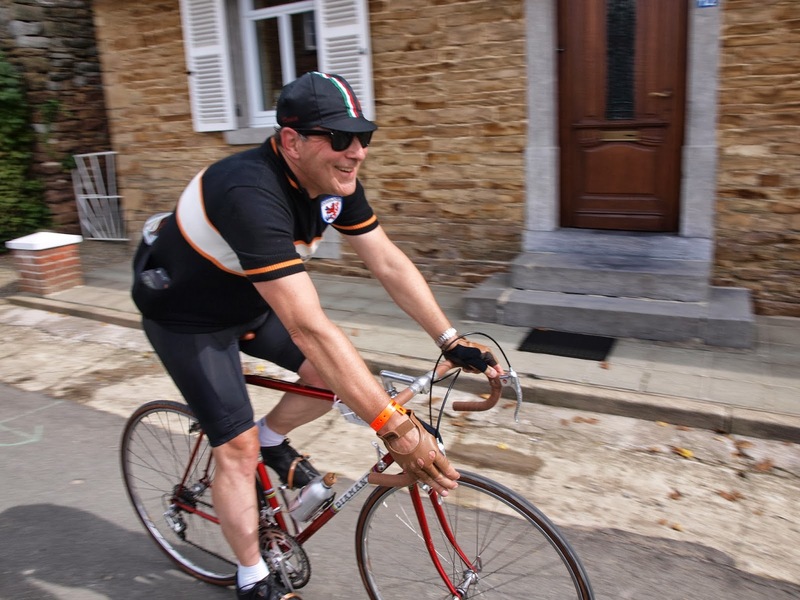 Having participated in the 6th Retro-Ronde in Flanders in May, I was bound to go to the other linguistic half of the country for another Belgian retro-ride and was present for the inaugural edition of “La Savoureuse” in French-speaking Wallonia at Ciney on August 25. It was an easy two hour early morning Sunday drive, taking me past Namur on lightly-travel roads in Belgium to the Parc Saint-Roch in the centre of Ciney where cars with bikes on their roof carriers were already beginning to crowd the little parking lot. The organizers had set themselves up in a tent in front of the stone chateau, which was an impressive building with a big gate but in fact had only been built in 1906 but in the style of an older building. Changing facilities were pretty limited There were lots of vintage bikes to be seen in the inner courtyard, with famous brands from the Netherlands and Italy evident, along with a few British rarities and some unidentifiable marques. Along with a few Merckxes, my Cicli Diamant was about the only Belgian-made bicycle around. Unlike l'Eroica, the Retro-Ronde or Anjou Velo Vintage, there was no real bicycle market featured although a custom framebuilder had a display and there was at least one tent with old bikes. Registration was very quickly accomplished and everyone received a nice cloth musette with the “La Savoureuse” logo printed on it and containing a number for the bike, along with plastic cables ties, a wristband with sections to tear off at each of the food stops, and a “Carnet de Route,” providing information about the routes (20/60/90 kms). There were also some brochures from the sponsors, including the primary one, the Maison de Tourisme Condroz-Famenne, which was promoting the “Vallées des Saveurs,” or the “Valleys of Flavours” and hence the name of the ride. Additional brochures informed us of other events, including the Festival of the Tomato and Its Family, as well as the Festival of the Cheese Route. Ah, Europe! As an aside, as is the case with other events like this one must give credit for the excellent graphics employed. The La Savoureuse posters (in Flemish and French) look wonderful and the website (www.lasavoureuse.be in French and English) is also an example of commendable design. The starting gun was fired at the very civilized time of 10:30 and the assembled mass of cyclists rolled gently through the stone arch gate and up a little hill, where already some of the riders experienced some athletic challenges. The rules of participation are quite liberal: a bicycle built before 1987 (or one built in the traditional way of steel frames), downtube shift levers if it has variable gears, and no clipless pedals. Singlespeed and fixed gear bikes are allowed (but no carbon ones! ), and, oddly Brompton folders. There were some very fine bikes, including a rare and beautiful Rene Herse, as well as the heavy “roadsters” beloved by participants in Tweed Runs. The organizers suggested suitable clothing and although I did not entirely return to the moustache era I had my appropriate RSV Vagabund '13 (our imaginary classic cycling club) wool jersey, cotton cycling cap, white socks (of course! ), retro Roeckl gloves and a pair of Wayfarer-style sunglasses. However, while it makes a much better photo if you are not wearing a helmet, and riders in Europe don't seem to care about them at these events, this was my first long ride without modern head protection in many years and it made me somewhat uncomfortable. The weather had been forecast to be quite poor but by the time we left it looked fine and I dispensed with my rain jacket. Nobody at these events goes particularly fast but I found myself overtaking many people as my bicycle, from the late 1970s, would have been one of the more modern ones but just as I was coming nicely into a rhythm it was time to stop at the Chateau de Ry for our first food stop. We had ridden all of 9 kms. One of the stated goals of the ride was to provide participants with a sampling of the local products in the “Valleys of Flavours.” The Chateau, a private estate that has always been in the hands of the Counts d'Aspremont Lynden, was built in 1598 and is sited in a lovely park. We rolled in along the gravel driveway, set up our bikes where convenient and lined up for a glass of champagne and a “sucette de foie gras,” or chocolate-covered pate of duck liver. This is quite different than the usual bananas and energy bars! After chatting with a British couple in period costume who had gotten some rental bicycles for the event, I returned to my bicycle and proceeded up some steepish hills, riding through the villages of Nettinne, Heure, Moressee and Maffe and was beginning to think that the next food stop would be coming up soon. However, although the route was well-marked I somehow managed to miss the second stop at 24 kms entirely. This was a bitter disappointment as the featured delicacies were beer and sandwiches made with local cheese. The 90 km route is a Figure 8 and when I came to Hamois I found another food stop but in fact this was the fifth one but I used up one of my wrist band coupons and had a glass of beer, even if it was out of sequence. There was live music, which was the case at most of the stops, and a party atmosphere. I also noticed that there was no other food but did not realize that this could be a problem later. The next stretch from Hamois via Havelange through Petit-Avin was along a very nicely constructed trail built on an old railway right of way. There were signs along the route with photos of what things had once looked like and a had a brief stop across from an old station to read about the nearby sanitarium where patients from Brussels had once been treated. Stop 3 was a farmyard in Ossogne, where I enjoyed fresh strawberries prior to setting off down the road the wrong way. I had thrilling descent on a wonderful road with new asphalt before realizing it was the wrong direction, so I turned around and dragged myself back up the big hill and found the signs pointing me the right way. Stop 4 in Barsy was located next to an unusual museum, the private Musée Monopoli, which looked like a fun place where lots of old automatons, mechanical musical instruments and other oddities were on display. I enjoyed a soft ice cream here and then headed southwest in the right direction. At least I thought it was until I realized I had not seen any route signs for a while. I may have been lost but I was making good time and as I sprinted along the empty road I was immortalized on video by a crew filming the event. LA SAVOUREUSE (Balade à vélo vintage) from D-Mo Prod. on Vimeo. At one point I rode up a gravel road and came to an intersection where, a moment later, another cyclist doing the ride went by and I joined him as we rode back towards Hamois (where I would not be entitled to another beer). We had a nice conversation en français and rejoined the rail-trail bike route but then he flatted near Emptinne and insisted I go on. I retraced my route to Hamois and then turned around and came back with a fast return to Ciney. My 90 km course had somehow become 97 kms, with 1300 m of climbing. The roads were generally good, cobbles and gravel were minimal but there were some challenging uphills as we passed through charming rural Wallonia. But as much as I enjoyed my strawberries and champagne, the lack of food during the ride was telling. Luckily I had bought some energy bars with me since there were no stores or bakeries to be found en route. This problem, and the lack of showers at the finish, are the only criticisms I can make of what was an excellent organized ride and I am sure that the other 170 “pioneers” who rode the first La Savoureuse would agree. Rolling back into the grounds of the Chateau at Ciney there was lots going on as the bar was doing good business, as was the barbecue. And no wonder: Belgian beer cannot be passed up after a nice bicycle ride, a Balade a Velo Vintage, like La Savoureuse. The other attraction was the drawing for all sorts of great prizes, including more beer but also baskets of local products, some snappy vintage-style clothing and, best of all, a handbuilt frame, presented by the builder himself and won by an older Belgian who was beyond ecstatic, to everyone's huge amusement. Every retro-ride has a different character but they all share one thing in common: all the participants are there to have fun!